Dauphin Island and Mobile Bay were mapped as early as 1519 by Alonzo Pineda. In 1699, the French explorer, Pierre Le Moyne de'Iberville named it "Massacre" because of what was described as a "mountain of human skeletons" found here, despite this, Iberville decided to locate a colony here because of the abundant timber, reliable supply of fresh water, and a great harbor. "Massacre Island" soon became the headquarters for French colonization along the Gulf Coast. The thriving settlement consisted of a fort, a chapel, government owned warehouses, and many private homes. "Massacre" seemed too ominous and inn 1707, the French renamed the island in honor of the heir to the French throne: "Dauphine." During this period the island was capitol of the Louisiana Territory which equaled almost two thirds of the United States! Although the colony was able to rebuild from a pirate raid in 1711, a devastating hurricane six years later almost destroyed the fledgling settlement. Over the next century, control of Dauphin Island switched from France to Great Britain and to Spain in 1780. Finally, in 1813 the United States seized the territory around Mobile Bay. The British captured Dauphin Island and used it as a proposed campaign against the city of Mobile. The British took Fort Bowyer on Mobile Point but they learned the War of 1812 had ended four months earlier. The war of 1812 proved that America needed adequate defenses for its long coastline. Construction of a fort on land as part of a comprehensive system of national defense began in 1821. Problems soon plagued the project. Engineers sited the fort so close to Mobile Bay that water actually entered the works at high tide. Worse, the contractors spent more money than their budget allowed. Over the next thirty years, the army attempted to renew construction of the fort. Congress appropriated $20,000 in 1845 but land disputes prevented any additional work. The army finally gained clear title to the land in 1853, but Joseph G. Totten, The Chief Engineer, decided to discontinue construction according to the original plan. Totten designed a completely new fort, incorporating the most advanced ideas in military architecture. The fort's plan called for ten guns to be mounted on top of each of the five walls. Each bastion contained emplacements for four flank howitzers. The design of the walls with their brick and sand construction, allowed them to absorb any artillery fire. A dry moat, crossed by a drawbridge, extended thirty-five feet from the base of the walls. These features, according to Totten's thinking, would keep enemy ships out of western Mobile Bay and would resist an attack from the land side of the fort. In 1853, Congress named the fortification for General Edmund Pendleton Gaines who had died in 1849. While still a young officer, Gaines received national recognition when he led the detachment which captured former Vice-President Aaron Burr who had been accused of participating in a conspiracy to commit treason. Gaines' men pursued Burr to the vicinity of Fort Stoddert in what is now Washington County, Alabama just north of Mobile. During the War of 1812, Gaines proved to be an able commander. He received a promotion to the rank of Brigadier General and won lasting fame for his tenacious defense of Fort Erie. For the next thirty-five years, Gaines earned the respect of settlers all over the southeast for his skill in the Indian Wars. He proved to be an honest and adroit military administrator as he attempted to bring order and discipline to the troops under his command. 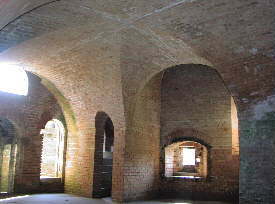 Most of the work on the fort was completed by 1861. The outbreak of the Civil War then left the remainder of work to the Confederate States of America, which added the last touches by 1862. 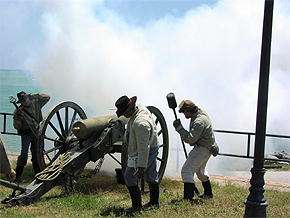 The role of Fort Gaines in the Battle of Mobile Bay, one of the wars most notable naval conflicts, is detailed in our History Tour Guide. In 1898 the fort was further modified as a result of the Spanish-American conflict. Three 6-inch disappearing naval guns and three rapid fire 3-inch naval guns were emplaced. Concrete gun mounts and ammunition magazines were added to the easterly walls, which eliminated the corner bastions and rain catches and blocked off the tunnels there. The gorge bastions, or corner blockhouses, are intricate structures designed to serve a dual purpose. In addition to the cannon ports situated in the side walls to guard the approaches to the walls, the entire roof area of each bastion also held a pattern of catch basins for rain water. The water was strained through a bed of shells and sand and carried to several large cisterns beneath the floors and in the yard. The bastions are connected to the courtyard by long arched tunnels which also provide access to the gun ports in the outer walls. The gorge bastions are inspiring examples of the detailed workmanship that went into the fort construction. The northwest bastion is preserved in its original condition. The bricks used in construction were made by slave labor on Dog River, twenty miles to the north, then barged to the site. The intricate masonry, all without keystones, shows the detail and knowledge of symmetry the early brick craftsmen applied to their work. Outside the walls in an area to the northwest, 500 feet distance from the entrance, an array of buildings was constructed, including a sutler's store, carpenter shop, blacksmith shop, lumber shed, stable, storehouse, kitchen, mess hall and several small utility buildings. Directly in front of the gate stood a barracks for troops. Following the Civil War, a bill was introduced in Congress calling for the establishment of a U.S. Naval Academy on Dauphin Island, but was defeated. The fort served in World War I with a Coastal Artillery unit garrison manning the disappearing guns. The site also became an anti-aircraft gunnery school during and following the war. World War II saw the fort used as a camp site for the Alabama National Guard and a base for the U.S. Coast Guard stationed there to operate against enemy submarines prowling the gulf in search of merchant vessels. Presently the Coast Guard uses its base there to take part in crash rescue boat operations. 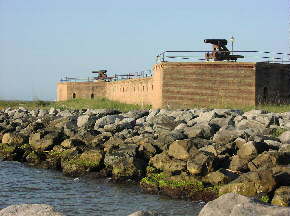 The United States sold Fort Gaines to the City of Mobile in 1926. The city in turn gave the property to the Alabama Department of Conservation, which deeded it to the Dauphin Island Park and Beach Board.